Let’s put this film in proper perspective. Do you remember the adorable kids, two brothers in Ozu’s “I Was Born But…”? Take one of them, say, the elder brother, let him grow older, let him have a sweet girlfriend, put him in soldiers uniform, send him to South Pacific islands or Indochina, let him fight against Americans or Australians, let him starve for a year or two, and let him survive. The war is over. He is now back in Japan. Here is your guy in this film. What happened to his salary-man father and gentle mother? Remember what he says to his sweet girlfriend? “You are the only one I have in this whole world.” Yes, his parents were killed (probably by air raid) and his brother was also killed in action. Also remember the other kids in Ozu’s film? The adorable bully who was stealing eggs from the bird nests, or the teenager working for local liquor shop, and the kid from the manager’s family? In “One Wonderful Sunday”, one of them owns the cabaret, the other is selling concert tickets at bloated price and most of them are dead. Between these two points in time, there were a lot of blood, violence, murdering, inhumane deeds and destruction. They could not afford to be either innocent, ignorant or honest. Some of them might have become ruthless murderers in China or elsewhere. Some might have advanced in military ranks to order others to die. Strangely, “One Wonderful Sunday” does not smell this bloodiness. Though many characters are repulsive, they are still far from the ones who reek of blood, death and cerebral impulse, whom we find in later Kurosawa’s works. Kurosawa himself has never been drafted during the war. It was said that Kurosawa did not pass the physical exam for the service. He did direct some propaganda films in TOHO during the war, partly because TOHO was fairly cooperative in war efforts. In many film history books, “No Regrets for Our Youth” and “One Wonderful Sunday” are usually discussed in the context of postwar TOHO Labor Union turmoil. Shortly before “One Wonderful Sunday”, some of the most popular actors and actresses left the studio expressing frustration. They were not happy with the consternation caused by standoff between executives and labor union workers. Those who left the studio included Denjiro Okochi, Kazuo Hasegawa and Setsuko Hara. This is partly why the big box office names are absent from the casts for this film (1). One of the demands from the Union was the autonomy of production. They demanded they could pick subject matters and manage production quality, so that the output would be more artistic and satisfying. This was partially accepted and many films during 1947 to 1948 were produced under the control of the Union. Naturally, the budget tended to inflate, shooting schedules were delayed and many of them were not meant to be box-office friendly. “One Wonderful Sunday” was one of those films. This film has been mentioned along with the words like “Capra-esque” and “Neo-realismo-esque”. I would rather say this film has its roots in silent era. A connoisseur of Japanese films would be reminded that the genre of “little people’s comedy-drama” had been one of the mainstreams in Japan long before the war. Shochiku was the studio that excelled in this genre, with talents like Ozu, Shimizu, Gosho and Saito. The very first feature film of this genre was “Sunday (日曜日, 1924)” directed by Yasujiro Shimazu. The film was lost, except for a couple of very fascinating stills. What regular boys and girls do in a day off had been a subject of sincere, heart-warming films for many years. Also, I was reminded of late silent era German Expressionist-Hollywood films such as “Lonesome”, “Crowd” and “Sunrise”. Tales of the poor couple in a large city, with ups and downs, but they have each other in the end. Many of the acting by Numazaki is reminiscent of that of George O’Brien in “Sunrise”. Let’s put this film in another perspective. “Grave of the Fireflies (火垂るの墓, 1988)“, the Ghibli animation directed by Isao Takahata, describes the miserable state of war orphans immediately after the war. During the years of 1945 and as late as 1950, streets in large cities were filled with those children and adults who lost their homes and families, looking for food and shelter. Even those who had places to live were always worried about food, jobs and food. Food ration system was not functioning. Black markets were growing faster than ever. The judge at Tokyo High Court who refused to buy food from black market (he presided over many cases of blackmarketeers), died of starvation in 1947. In his last notes, he accused the government of failing and of expecting black market to fill the gap. Many urban citizens had to visit farmers in suburbs to buy vegetables and rice at inflated prices. 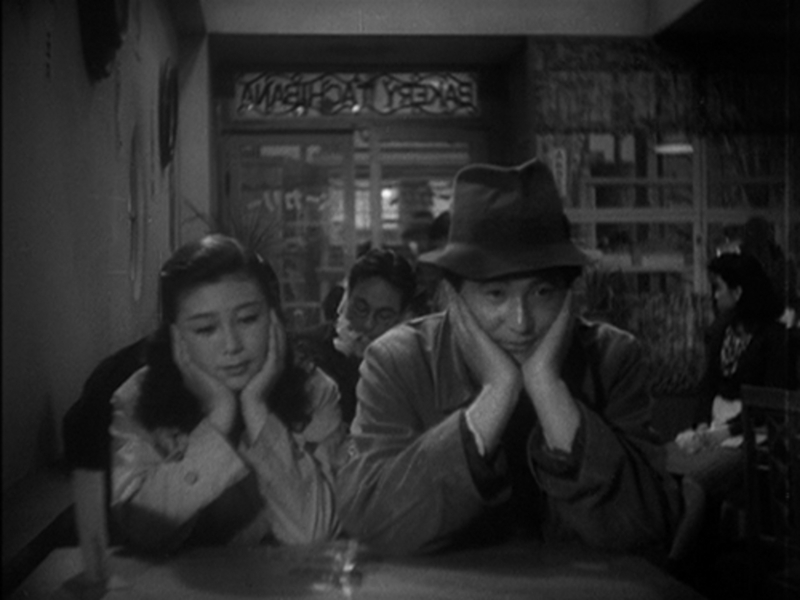 (There is a reference to these trips in Ozu’s “Late Spring”. (2)) The realities outside the theater was incredibly harsh compared to that in this film. Then, the famous “All you people, applaud” scene. It has been widely cited that Japanese audience at the time was not responsive to Masako’s address, while French audience (years later) gave enthusiastic applause. If this story is to be believed, I may say contemporary Japanese audience failed to sympathize with Yuzo and Masako. It’s not that they were not miserable. They were not miserable enough. Or their tragedies did not transcend through the screen. Their loss, their agony, their hunger. Blood, bones and flesh. Somehow, these two do not belong to the world of 1947. They appear to come from the world of silent films, prewar Shochiku little citizen films, films of much serene era. The film has a charming, vibrant quality. Baseball, zoo, long shot of the couple running through the street of Tokyo, their imaginary cafe. They are all delicately photographed, acted and directed. They are lovely scenes I adore. It may be just that the film was out of sync with postwar era. During the shooting of this film, Kurosawa peeked in TOHO’s New Face Interview. He would find all he would need, loss, agony, hunger, flesh and blood in the man he saw in the Interview. Hideko Takamine reportedly referred to the man “something extraordinary”. This “something extraordinary” was Toshiro Mifune. (1) Two principal actors of the film, Isao Numazaki and Chieko Nakakita were active members of the Union. (2) When the father talks about Noriko’s illness, he says “spending her holidays scrounging for food”.